Patsy Thompson Designs, Ltd. » Lost and Found…and a Give Away! Filed under Sizzix, Tips & Tricks. One thing I’d like to know about thread….why does my thread curl up after it comes off the spool? I found this with higher priced thread (Aurifil) and lower priced thread. There must be a reason why it does it. Your thread is beautiful and would be great for my landscape quilting. thanks. Oh they are lovely!!! I’d love to learn how to use these gorgeous threads to make beautiful quilting designs like you do! I am just beginning to learn embroidery so I don’t have many threads yet. This would be like a huge Christmas present for me!!! It great you are using up some of that fabric, I guess it all takes time. Loving the thread! I am a threadaholic! I quilt on a domestic machine, and for the life of me, I can’t figure out how to use a cone of thread without having serious tension issues. Even using a thread stand, it’s always a problem, yet I see others use it just fine. I must be doing something wrong! Looks like a beautiful set of threads. Thanks for the chance at the giveaway! Thread question: Wrapped thread …. what does it mean? What a great giveaway! What size needle goes with rayon thread? The chevron quilt looks like it would have great potential for machine quilting with the rulers! Please don’t enter me in your giveaway, as I’m truly just commenting to share that I enjoyed you post. And I’m looking forward to seeing how you quilt your Chevron. This design has always called out to me for FMQ feathers, but again I’d like to see what you create with it. While blues no longer work in my household, they are still beautiful. And I’m sure your blue/white quilts will be spectacular when you are finished. I also purchased several dies on the Sizzix sale. I didn’t know what to purchase, only that it was a great sale. Since I am on such a very limited budget, I would love to have some suggestions on which dies would be a good basic to start a collection with. 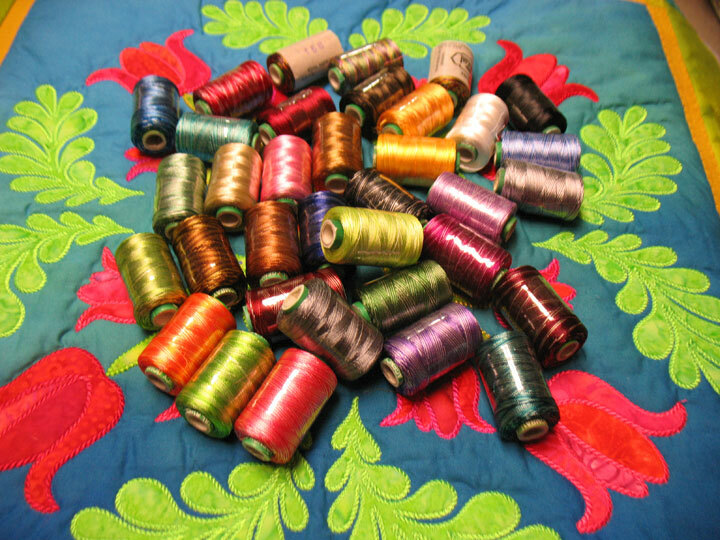 As for thread, I have a lot of rayon and polyester thread I use for machine embroidery. Can they be used for quilting? Is it okay to store rayon thread on a wall rack in a room that does not get direct sunlight? Love the quit, sign me for the drawing. I love to embroidery and my sister-in-law gifted me a Janome 11000 embroidery machine with all the toys to go with! Now I need more thread. 🙂 Love the embroidery you come up with. I’ve not used many different threads since I’m just beginning to dabble with free-motion quilting. The spools that you show sure are pretty! Am doing the same thing in my sewing room. Very difficult to get rid of fabrics you loved once but will never use, as well as those you look at and think “why did I ever buy that”. And the colors of your rayon threads are gorgeous. I quilt on my domestic machine and would like to learn how to use metallic threads in my quilting. I want to learn to use more thread than just cotton for free motion and especially hyper quilting! Thanks for the chance to win. Wow! That embroidery thread looks great. I just purchased a slightly used Bernina 630E and want to find out what threads work best with her embroidery unit. I’ve done some machine embroidery on a Bernina 440, but I’m really not very experienced yet. I need to learn about thread tension, bobbin threads, and how it all works together for embroidery. Stabilizers have me stumped, too. There are SO MANY choices! Would love to learn what each different thread is for” I have yet to find a good description of all the different threads out there. Would be great to have some kind of a chart that you could refer to each time you decide you want to make something. How do you decide what TYPE of thread to use for quilting? Here’s my dilemma: I made a Ricky Timms convergence quilt top that love…I think it’s stunning, if I say so myself! 😉 My free-motion quilting skills aren’t that great and I think that’s part of the reason I hesitate to quilt it. But the other is the thread. I’ve decided I want to use a variegated thread but don’t know whether to go with cotton or rayon thread. BTW, I absolutely love this method of making HST and I love the star layout you created with your HST pieces! I definitely have to try it! I love all thread colours available now, but still struggle with metallic at times. I’d love to learn to machine quilt with them. I would love to know more about using thread in machine quilting, especially free motion. Your chevron baby quilt is so cute, cannot wait to see it finished. This gives me an idea of what to do with some of my stash fabric. I could use this thread for appliqué, but is it safe to use thread other than cotton to quilt a cotton quilt? Or would it ‘cut’ the fabric? I haven’t used rayon in quilting and am curious as to how it would work on my machine. Do you use it on a longarm machine? Thank you. I have the same die, and didn’t know I could do this. Thread is addictive like fabric and paper. The colors, the texture and the possibilities are mind boggling. I have a mid arm and surprisingly a lot of threads work if you adjust the tension correctly. I have dabbled with thread art on both the domestic and mid arm. All those thread colors that you are showing would go a long way to making a few wall hangings, table coverings and quilts. Well I don’t have to tell you as you are an expert at stretching the limits. I have sat at your table (ie blog) and absorbed and learned. Thank you for sharing. I confess to being a “threadaholic” but I’d like to hear more about your decisions to use variegated vs solid threads in a quilt. It often seems that variegated threads sort of get lost in busy-patterned quilts. p.s. I understand your angst about getting rid of stuff from your stash. A friend bequeathed me her [large] fabric stash just when I almost had mine under control, so I’ve been frantically making “community quilts” for our guild in an effort to get back to having only 2 floor-to-ceiling fabric cabinets (and not extra bins sitting around)…. Im just starting to collect threads now that I am working on art quilts! Thanks for the opportunity to have those lovely babies! I’d be interested in knowing why rayon thread behaves differently when you sew than a similarly shiny polyester thread. Love the quick chevron quilt. 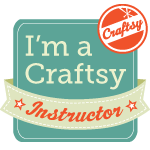 Just found your site and YOU are SEW inspiring! Thanks for the quick tips and pictures of your gorgeous quilting! Wow, I am just learning how to quilt. I can barely sew a straight line. Until recently I thought every thread was the right one. I’ve recently learned just enough to scare myself to death and am afraid because now I think they are all the wrong ones. Either way I love the color and would love to learn more about it all! By the way, I adore chevron and blue – you did a beautiful job. I’m in awe. I would love to play around with those threads to do some thread painting. I would love to win this. Thread is awesome and I would love to “play” with it on my quilts. The threads are so luscious! I also would like to learn about thread painting. I also enjoy your machine embroidery discussions about technique. Hi Patsy! I love checking your site and today I find a fabulous tip for stash control AND a giveaway! WOW! 5 months ago, I got an embroidery machine and am curious as to what threads are best suited for it. I haven’t had much time to play with it but hope to start diving into it soon. Hope you have a wonderful Easter week! I’d like to know which threads work best for which applications.